When it comes to Pilates, people are generally die-hard enthusiasts or they’ve never stepped foot in a Pilates studio. If you’re in the latter group but are curious to know what all the fuss is about, you’ve come to the right place. In this blog, we’ll tell you everything you need to know about Pilates – the why, when and how – including monthly video tutorials of exercises that will help strengthen and lengthen your muscles – the Pilates way. We’ll also offer you advice on diet, nutrition, fitness and dealing with injuries. Devised by Joseph Pilates in the early 1900’s, Pilates is a series of slow, controlled body conditioning exercises that target the deep abdominal and postural muscles – (the core muscles). Every Pilates movement applies the six Pilates Principles of centring, concentration, control, precision, breathing and flow to help you establish a strong body – from the inside out. Pilates is also great for the mind. Each exercise requires mental focus – to perform the exercises correctly, while maintaining your posture and remembering to breathe. It’s also a great way to escape life’s little dramas for an hour. How long before you’ll start to see results? Joseph Pilates said that with his method of exercise ‘in 10 sessions you will feel the difference, in 20 sessions you’ll see the difference and in 30 sessions you’ll have a whole new body.’ Our clients report back that after a few sessions, they’re noticing a difference in the way they hold themselves and how their clothes fit. When most people think of Pilates, they associate it with mat work. But Joseph Pilates’ original exercise system started out on a machine – and it’s still done that way today, with the Pilates Reformer. The Reformer can be quite an intimidating sight at first. It looks like a metal bed frame, with a sliding carriage and adjustable springs, which regulate tension and resistance. Cables, bars, straps and pulleys allow exercises to be done from a variety of positions – even standing. The resistance helps you strength train, while the alignment of the device keeps your body straight and supported. Don’t judge the Reformer by its appearance, because after a few workouts, you’ll realise that it’s one of the most versatile and effective pieces of exercise equipment ever made – and a lot of fun to use too. Check out this video, click here> to see the Pilates Reformer in action. Mat v Reformer: Which is best? Mat work is the bread and butter of Pilates. It’s the foundation upon which everything else rests. With Mat Pilates, you use your own body for resistance, while your core muscles work hard to hold you in position while you perform the exercises. If you’re completely new to Pilates, mat classes are a great place to start, as you’ll learn the basic moves and how to control your muscles and breathing during them. With the Reformer, you’re working against resistance from pulleys, springs and levers, to build strength and develop flexibility. The resistance can be increased or decreased, to adjust the intensity of your workout. You can perform very basic to highly advanced movements in virtually any position on the reformer, and certain stretches, such as those for the hip flexor, cannot be duplicated on the mat or any other piece of equipment. 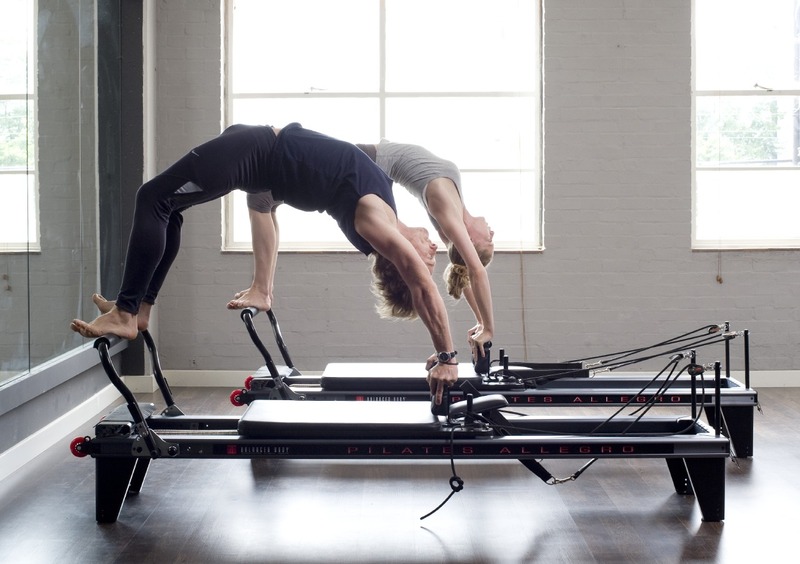 With the addition of a canny piece of kit – the Jumpboard, you can add a whole new sequence of exercises to a Pilates Reformer class that have a cardiovascular element. It’s good fun too – like being on a trampoline whilst lying down. Tempo Pilates is an intense, high-calorie Reformer workout, set to funky music with an upbeat tempo. It’s a fresh, upbeat approach to Reformer Pilates, that’s fun, challenging and stylish. Exercising to music helps teachers create a tempo to teach to, and ensures that everyone is working at the same pace. This makes it easier for teachers to spot students performing movements incorrectly. Exercising to music also helps students synchronise their movements with their breath, through the traditional beats of 4/8 or 16. The number one benefit of Reformer Pilates that has most people waiting their turn at the machine is the abdominal definition it gives you. Talk about killer abs – the Pilates reformer works the transverse abdominus, a muscle that isn’t easy to reach with any other type of exercise. This muscle lies deep within the abdominal wall and is an integral part of the body’s core. Strengthening this muscle alone on the Reformer will work the abs from deep within, and engage your spine, making that stronger, too. No crunches or sit-ups will get to this muscle as well as a Reformer will. With a full repertoire of upper and lower body exercises that emphasise core engagement, you’ll feel every muscle in your body working during a Tempo Pilates workout – and you’ll feel the benefits quickly. From simple changes like better posture and flexibility, to dramatic slimming, toning, lengthening and strengthening; once you feel the difference in your glutes, inner thighs, core and triceps, you’ll wonder why you didn’t try it sooner. If you’re fed up of workouts that include 4 moves repeated 50 times to exhaust your muscles, you should definitely try Tempo Pilates. Classes take you through a whole series of workouts, repeating each movement 6-12 times. You’ll often work the same muscle group in multiple exercises, but in a different way each time. One thing’s for sure – you won’t get bored in a Tempo Pilates class. Tight muscles are bad news. They pull on our joints, restrict our movement and are often the root cause of injuries in our necks, back, knees and hips. If you work in an environment where you sit for long periods of the day, it’s important to keep your muscles stretched to counteract the tightness. Similarly, playing sport and working out can leave your muscles feeling tight and tender. Reformer Pilates stretches your body in every plane, twisting and rotating you like never before. The springs provide the magic to take your flexibility to the next level. They can be adjusted to cater for whatever your base level of flexibility is. So whether your goal is to touch your toes, do the splits or perform an amazing backbend, you’ll be astounded by how much your flexibility can improve. Each month we’ll be recommending Pilates exercises to tone and strengthen different parts of the body. As we head into summer, there are several areas of our body that tend to need toning. This month, we’re going to focus on those pesky upper arms – or more specifically, the triceps, with the uber effective Cobra Push-up. Start face down on your reformer with your toes pointed on the foot bar and palms resting on the carriage close to your shoulders. Lift your torso off the mat and keep a soft bend in your elbows. This is your starting position. Engage your gluteus and quads drawing your ribs away from the reformer and lifting your hips high. While piking up and slowly lowering down the aim is to keep the reformer completely still. Be sure to keep your elbows close to your torso as you lower – not allowing them to flare out to the sides. Keep your hands neutral with fingers pointed forward. Aim to do 6-12 reps.
We want this blog to be as interactive as possible, so if you read anything you’d like to know more about, or if you have a burning question about Pilates, post it below or Tweet us and we’ll answer it in the next blog. As an incentive to try one of our Tempo Pilates classes, we’re running a introduction offer for anyone new to Tempo Pilates. Instead of £26, if you visit our Sign-up page and create an online account click here> your first class £13 option will appear when you make a booking. Why not experience the many benefits of Tempo Pilates for yourself? We have three studios – in Hackney, Shoreditch and Covent Garden – each offering a range of classes to suit every level of fitness. So book your class today! We’re over the moon with all the Five star reviews coming in and we would like to say a huge thank you to our students for all the support. Need to book your next holiday? Join our Tempo Pilates trainer Gina in Halkidiki, Greece on 23rd-29th May 2016 for her 6th Pilates retreat to invigorate your mind, body and mood. Ps. Only 4 places left.